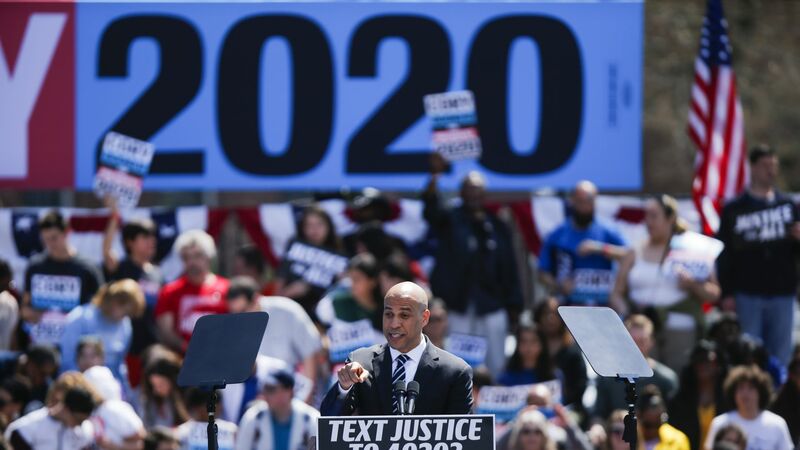 Sen. Cory Booker (D-N.J.) kicked off his 2020 presidential campaign in his hometown of Newark, New Jersey, Saturday with a pledge to fix the justice system and legalize marijuana. Details: Booker said his administration would also look at closing the racial wealth gap and tackle climate change. He invoked the Rev. Martin Luther King Jr when he said the U.S. couldn't wait for social and economic reform. "We are here today to say, we can't wait," he said. What he's saying: "We can’t wait when powerful forces are turning their prejudice into policy and rolling back the rights that generations of Americans fought for and heroes died for,” he said. "We can’t wait when this administration is throwing children fleeing violence into cages, banning Muslims from entering the nation founded on religious liberty, and preventing brave transgender Americans from serving the country they love." The big picture: Booker has returned modest results in preferred presidential polling. His campaign manager Addisu Demissie told reporters they had a longer term goal to win the election, rather than the news cycle. Booker's marijuana pledge builds on a bill he reintroduced in March that would legalize the drug on a federal level and supersede the 10 states and Washington, D.C. , which have legalized recreational marijuana.